Puerto Rico defaulted on largest debt payment so far, as lawmakers work on new legislative solution to the island’s debt crisis. Several much anticipated rules (proposed and final) were released this week. Treasury Department announced efforts to stem tax fraud, largely in response to Panama Papers. House and Senate were on recess, working back home; both scheduled to return to the District next week for legislative action. Top Search on POPVOX this week: "firearm"
On Monday, Puerto Rico defaulted on $422M debt payment, the largest so far by the island. Puerto Rican Gov. Alejandro García Padilla said the territory will be unable to make a $800M payment due July 1, saying Congress needs to restructure the island's debt or the U.S. territory will need a bailout. Puerto Rico owes investors about $70B in total, compounding from a decade of economic stagnation and population decline. The island first defaulted on debt in August, but this is the first default by the Government Development Bank, which provides liquidity to Puerto Rico's government agencies. This week Treasury Secretary Jacob Lew wrote to Speaker Paul Ryan, urging resolution on "few outstanding issues" on legislation to help Puerto Rico. Leading bill to address Puerto Rico's debt crisis stalled last month when division emerged over whether the package could be considered a bailout and how best to restructure the island's debt. Lawmakers are working on a new bill to address the Puerto Rico debt crisis. The new bill would contain new language clarifying existing legal and constitutional prioritization of Puerto Rico's creditors, and the fiscal oversight board's role in preserving that lineup. Rep. Sean Duffy [R, WI-7] is expected to remain the bill's lead sponsor, and the bill is expected to be released next Wednesday under a new bill number. Rulemaking happens after a bill becomes a law, as the Legislative Branch passes the policy over to the Executive Branch to be put into action, and agencies work to develop policies and practices for implementing laws. This process is important and frequently misunderstood. While rulemaking happens every year, it inevitably accelerates in the final year of a presidential term, as the administration finishes up its work. 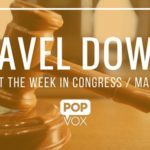 We at POPVOX will be sharing more about the rulemaking process and pending rules and regulations over the coming weeks and months. POPVOX tools for public comments to agencies. OMB: “Banning the Box” on Federal Job Applications: A proposed rule would prohibit federal agencies from asking about credit or criminal history until a conditional offer of employment has been made. 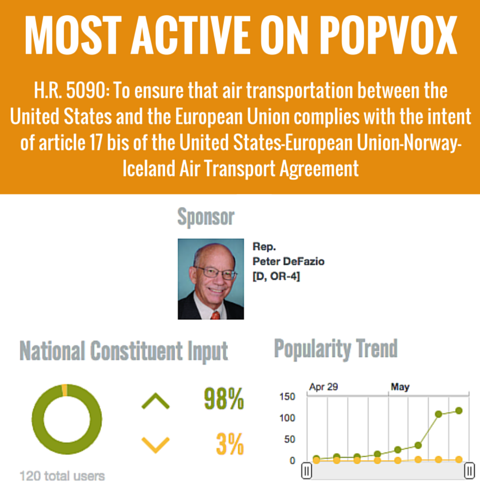 * Several groups have used POPVOX to register official public comments on the topic. Treasury issued a final rule requiring "beneficial owners" of anonymous shell companies to be disclosed at the time the company is formed. Treasury Secretary Jack Lew sent a letter to Congress calling upon the Senate to ratify eight pending tax treaties that would allow for enforcement of U.S. law in those countries. The Administration is requesting that Congress pass legislation further restricting shell companies, and allowing the U.S. to provide its partner countries under the Foreign Account Tax Compliance Act with the same information that the partners provide to the IRS. New Kaiser survey reports 1 in 5 Americans have a family member who's been addicted to prescription painkillers. Most Americans believe the federal government is not doing enough to combat the opioid epidemic. New from CRS: Current Senate has confirmed the fewest civilian presidential nominees of any Congress in the past 30 years. Economy added 160K jobs in April, the lowest in 7 months and unemployment held steady at 5 percent, around an eight-year low. Supreme Court has accepted only six cases since Justice Scalia's passing, marking reduced workload. Justice Department told North Carolina that its bathroom use law violates the Civil Rights Act, and that the state could lose millions in federal funding. Tennessee Gov. Bill Haslam [R] allowed guns-on-campus bill to become law without his signature, while Georgia Gov. Nathan Deal [R] vetoed campus carry bill. Alabama Gov. Robert Bentley [R] has until mid May to decide on legislation that would deny licenses to abortion clinics within 2,000 feet of K-8 public schools, as well as legislation banning a commonly used second trimester abortion procedure. Sen. Sherrod Brown [D, OH] introduced bill to test lead in drinking water, update testing requirements, and determine the financial capability of communities to implement clean water infrastructure programs. House Republicans plan to release a wide-ranging poverty proposal before July, largely focused on TANF, enacted under the 1996 welfare reform bill. TSA asked Congress to pay for overtime to shorten lines. Congress typically allows agencies that provide a written explanation to shift money amount accounts, but lawmakers who object can block the move. House Democrats on the Natural Resources Committee released a report saying austerity cuts in Puerto Rico have made the island more susceptible to the Zika Virus. Rep. Vern Buchanan [R, FL-16] became the first House Republican to back the Obama administration's request for $1.9B in additional funds to combat Zika virus. U.S. Foreign Surveillance Intelligence Court did not deny any government requests for electronic surveillance, totaling 1,457 requests in total, on behalf of the NSA and FBI. House Intelligence Chairman Devin Nunes and House Armed Services Chairman Mac Thornberry requested an investigation into a planned intelligence center for the Pentagon in the UK, saying the facility could be built at lower cost in other locations. Army captain sued President Obama over lack of ISIS war authorization, saying the Bush-era war authorizations do not grant authority and Congress would need to pass a new AUMF. Bipartisan group of lawmakers are lobbying appropriators to include language in this year's funding bills to expand visas for low-skilled foreign workers. White House announced new series of workshops and an interagency working group to study the benefits and risks of artificial intelligence. Testing a potential vaccine for the Zika virus will begin in September. U.S. and Russia persuaded Syria's government and moderate rebels to extend truce to the northern city of Aleppo, although sporadic clashes continue. Senate Homeland Security & Government Affairs Chairman Ron Johnson asked Government Accountability Office to conduct its first in-depth look at the Office of Special Counsel since 2007. Labor Department launched new jobs site for veterans. President Obama commuted the sentences of 58 federal prisoners convicted of drug crimes. Atheist group is suing House Chaplain Rev. Patrick Conroy after being rejected for request to deliver invocation on the House floor. Senate Republicans and Democrats from coastal states are pushing for legislation that would make it easier for temporary foreign workers to enter the country — designed to boost seasonal workforces.